Myke Pro Nursery WP - Lahave River Berry Farm Inc.
Myke Pro Nursery WP is a concentrated mycorrhizal inoculant in powder form used for liquid application (cuttings, seeding or repotting trees). Myke Pro Nursery WP is a concentrated mycorrhizal inoculant in powder form used for liquid application (cuttings, seeding or repotting trees). It contains two species of mycorrhizal fungi that are compatible with most trees, shrubs and herbaceous plants. Mycorrhizal fungi have existed since the first plants appeared on dry land more than 450 million years ago. They form a close symbiotic relationship with plant roots. Mycorrhizal fungi provides a secondary root system that is considerably more efficient and larger than the plants own root system which enables the plant to draw nutrients from the soil that the root system would not be able to access otherwise. This fungus-plant alliancestimulates plant growth and accelerates root development. Mycorrhizal fungi makes the plant less susceptible to soil-borne pathogens and to other environmental stresses such as drought and salinity.In return the plant provides carbohydrates and other nutrients to the fungi. They utilize these carbohydrates for their growth and to synthesize and excrete molecules like glomalin (glycoprotein). The release of glomalin in the soil environment results in better soil structure and higher organic matter content. However, in soil that has been disturbed by human activity, the quantity of mycorrhizae decreases drastically so that there are not enough of them to produce a significant benefit on plant growth and health, hence the importance to compensate for this lack. 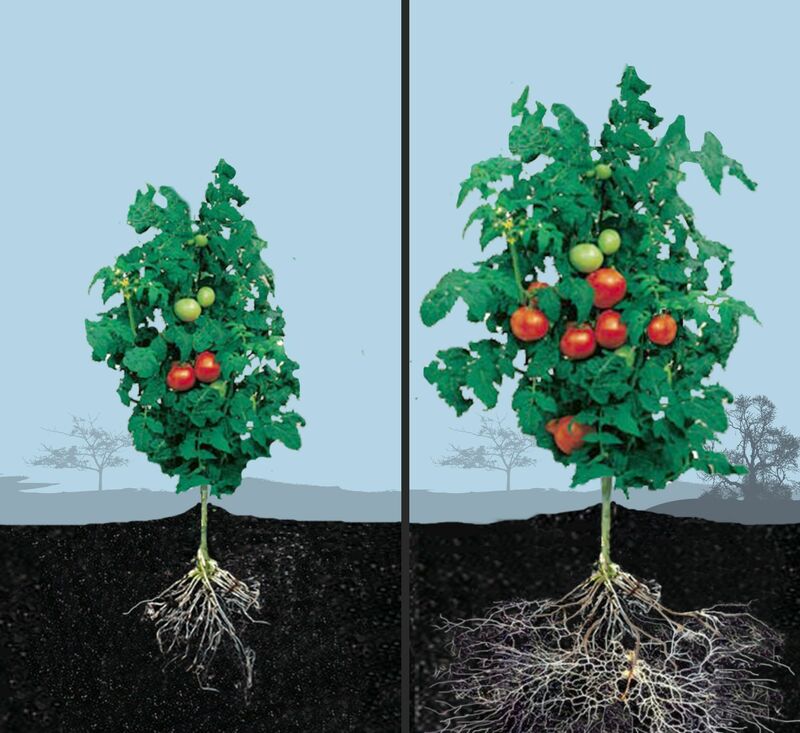 The image below shows the benefits of using mycorrhizal fungi. The plant on the left has not had any mycorrhizal fungi added to the soil. The plant on the right has had mycorrhizal fungi added to the soil. As you can see the plant with mycorrhizal fungi added to the soil is larger, has more fruits, and of course a much larger root system. Mix 1 bag per 200 L (1.1 lb per 53 US gallons) of tap water at a maximum temperature of 20°C (68°F) to avoid temperature shock. Start by pre-mixing the product with a small amount of water and gradually mix in more water until the desired dilution rate is attained. Maintain agitation in the tank to keep the product in suspension when spraying. Remove filters and use nozzles with a minimum of 18 mesh (1 mm) openings to avoid clogging. Remove surface debris to ensure the mycorrhizae will penetrate into media or soil. It is preferable to pre-moisten before spraying. Apply diluted product to root system, or to media and soil surface around active root area, according to the application chart. Remove surface debris to ensure the mycorrhizae will penetrate into media. It is preferable to pre-moisten before spraying. Media should be at room temperature to avoid temperature shock at application. Apply diluted product to media. Ensure even distribution for optimum homogeneity. This diluted product can treat 3 m3 (4 yd3). Avoid over-watering immediately after product application to prevent any leaching. Mix 1 bag per 200 (1.1 lb per 53 US gallons) of tap water at a maximum temperature of 20°C (68°F) to avoid temperature shock. Make a shallow trench or poke holes around each plant at the drip line and near roots to ensure mycorrhizae will reach active roots. Holes should be 40 cm (16 in) apart. Apply the diluted product directly into holes or trench at the drip line. Add 200 ml (7 fl. oz) of the diluted product per hole. Ensure coverage of the entire circumference of the drip line for each plant. For fine and abundant roots: use 1 bag per 25 litres (1,1 lb per 6.6 US gallons) of water. For coarse and thick roots: use 1 bag per 11 litres (1.1 lb per 3 US gallons) of water. Water must be at a maximum temperature of 20°C (68°F) to avoid temperature shock. Dip bundles of root material into the tank: ensure roots are covered with slurry. Once plants are treated, do not allow root material to dry out and plant as soon as possible. The product will deposit in the bottom of the tank without agitation. Call to see if we are available.